In the picturesque valley of Kashmir, there are two lovers – conceptualised as the modern-day Laila Majnu. They meet, admire the beauty around, only to be separated later due to raging family rivalries. But, as the fate has it, they meet again, until the two get lost in oblivion, in search of the ultimate bliss – something that only the other-worldly lovers get. Laila, played by Tripti Dimri, is the city’s heartthrob. She enjoys the attention she gets from men while on her way to college. Qais, played by Avinash Tiwary, is a known rich-brat, allegedly famous for breaking hearts and using women as commodities. The two accidentally meet each other and love strikes. They decide to get married but their plans are marred by the old enmity between their fathers, who are two biggies of the town. What follows is years of wait and a process of self-realisation. Only when the two are finally going to be together forever, Qais sets on an unbelievable journey of finding love with the Laila of his dreams. He no longer lingers on the actual presence of his beloved. For him, Laila is always with him, and he is able to see her the way the world can’t. “Yeh ishq nahin aasaan, bas itna samajh lijiye… Aik aag ka darya hai, aur doob ke jaana hai.” The poetry written by Jigar Moradabadi, is the basis of most Imtiaz Ali films. Even this new one, that’s directed by Sajad Ali. Laila Majnu is a glossy attempt to bring in front the ages old popular Persian folklore. Ali, however, fails to make it relevant today. In the first place, the lovers in the film never even appear to have fallen in the kind of love which is capable of self destruction. The characters don’t evoke empathy, even when Qais is wandering in woods talking to himself, terrorising the local people around. Avinash seems effective at places, but his Majnu is overstretched and over-acted. 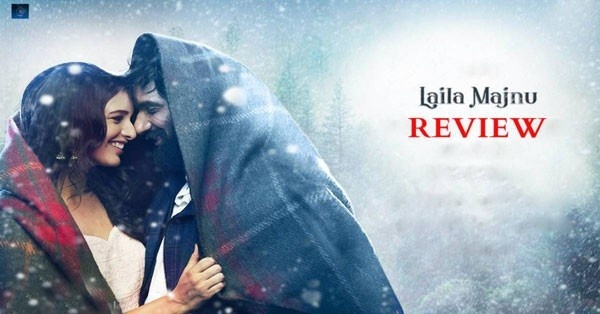 While Imtiaz keeps the flavour of his style of cinema alive in Laila Majnu, the story lacks the modern-day connect. The idea of becoming a ‘deewana‘ for somebody in love is too-outdated-to-believe. There are major ups and downs in how Laila’s character evolves in the narrative. She’s shown as a girl, who’s excited about life, and doesn’t fear in exploring anything new. She’s like a pretty blooming flower in a much conservative settings of a Kashmiri Muslim family. That is established when she’s asked to have her dupatta in place by her mother. Or her sister’s continuous resistance to her increasing proximity with Qais. Her lively answer to everything objected: ‘Chal na, try karte hain‘. Now, when the same Laila, who’s full of life, decides to let go of his lover so easily – it does raise questions. Why doesn’t she see that her man needs medical help? What happened to the rebellious Laila who didn’t shy away from telling her father that he has no business in the decisions of her life anymore? In a scene when he tries to stop him from eloping with Qais, she tells him “Raat ke andhere me ja rahi hun, piche ke darwaaze se ja rahi hun… isse zada main aap ke liye kuch nahi kar sakti.” The same courage gets lost in oblivion later and you are left to rediscover Ali’s Laila again and again in the plot. Take it as it is — For the most part in the film, Avinash seems to be copying Ranbir’s Jordan; while Tripti’s Laila is an absolute rip-off of Nargis’ performance as Heer – her over-pouty lips overshadowing her acting skills. The two are never able to establish the we-will-die-for-each-other connect to the audience. Neither do they hold on to the Kashmiri accent for long. Together, Ali’s Laila-Majnu lack both lustre and life. Imtiaz Ali’s Laila Majnu doesn’t have anything new to set on the table for you. It has the story which is widely discussed and the treatment which is cliched and predictable to describe. Even when you aren’t appreciating anything about Ali’s cinema, you are taking music that stays with you for long. Here, you don’t even get that much. One thing the film does for you though, as most Ali’s films do, is that it makes you want to pack your bags and explore the stunning locations of the valley. But, just that.